Upset with a driver, a cyclist hit his car bonnet and left a mark on it. 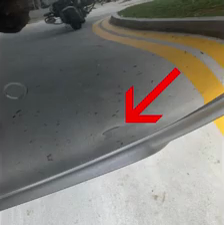 Facebook page ROADS.sg posted a video of the road rage incident that occurred in Yio Chu Kang on Tuesday (March 26), at about 10am. The car driver, known only as Alex, said via text in the video that he was travelling at around 40km/h and had signalled to turn left into a petrol station. While doing so, Alex drove past a cyclist, who was left tailing behind the car but had apparently "refused to slow down". The cyclist can then be seen gesturing angrily and then slamming his hand on Alex's car bonnet. A loud bang is also heard. Alex added in the caption of the Facebook post: "The cyclist did have contact with my car and an indentation was identified." In the video, Alex can also be heard shouting at the cyclist to "come back".